This is the designated neighbourhood zone for Auburn South Primary School in Melbourne, Victoria. You can search for a particular school or address in the search box in the top right-hand corner of the embedded map or zoom into an area of interest on the map. This is the designated neighbourhood zone for Auburn Primary School in Melbourne, Victoria. You can search for a particular school or address in the search box in the top right-hand corner of the embedded map or zoom into an area of interest on the map. This is the designated neighbourhood zone for Armadale Primary School in Melbourne, Victoria. You can search for a particular school or address in the search box in the top right-hand corner of the embedded map or zoom into an area of interest on the map. 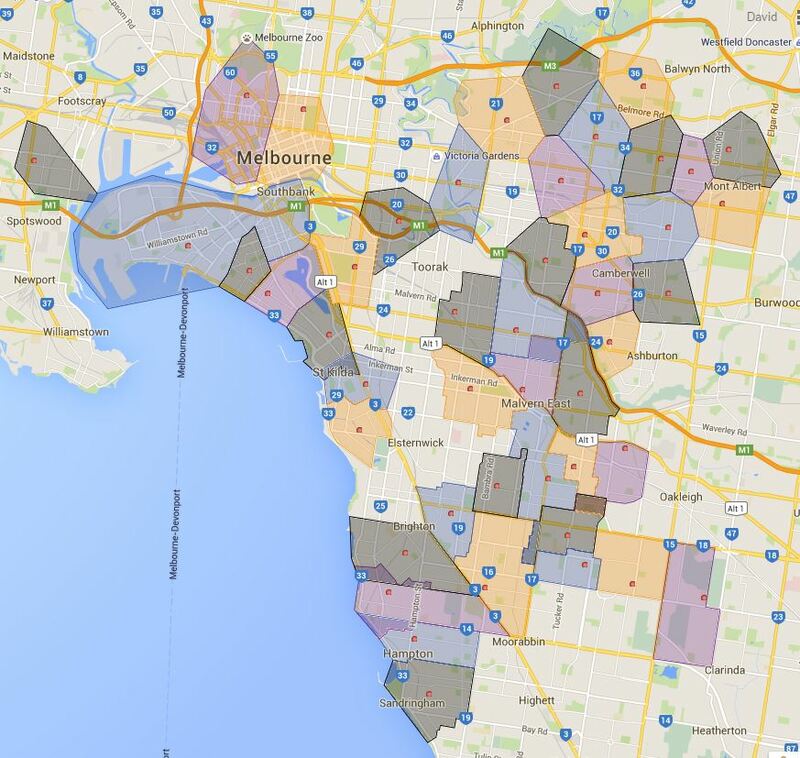 I am going through and making an individual blog entry for each Melbourne School that has specific zoning. Albert Park Primary School has the luck of being the first one I am putting up, I will try to put the rest of them up in the next few days if time allows. This is the designated neighbourhood zone for Albert Park Primary School in Melbourne, Victoria. This one is more of an introduction, as most of primary school with specific zoning fall into the inner Melbourne city, there are only a few that I am aware of that is not near Melbourne city center. Anyhow following is an overview map of that, I plan in the next days make the individual school catchment/zone map available on the site. 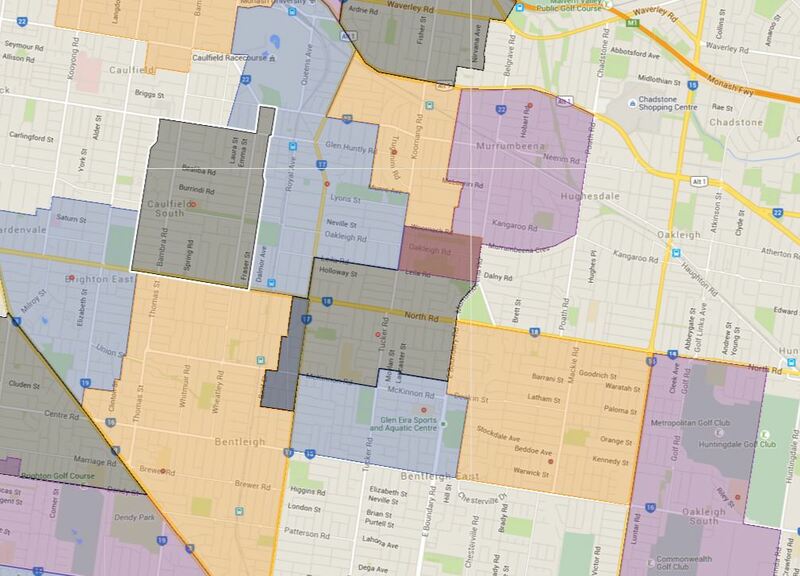 As usual contact the school in question or Department of Education for the final confirmation and you can also access the full list of Melbourne Primary School that has specific zoning by visiting Melbourne Primary School Zone Catchment Map. For people who are not familiar with Australian education system, this is a bit of general information entry. Education is responsibility of the each State, they are however funded at State and Federal level. Each Australian State are responsible for the day to day running of schools within their territories. With each state responsible for the education in their own territory, there are both subtle and both significant differences in how the school Catchment/School Zone/Local Drawing Area are defined in each state. 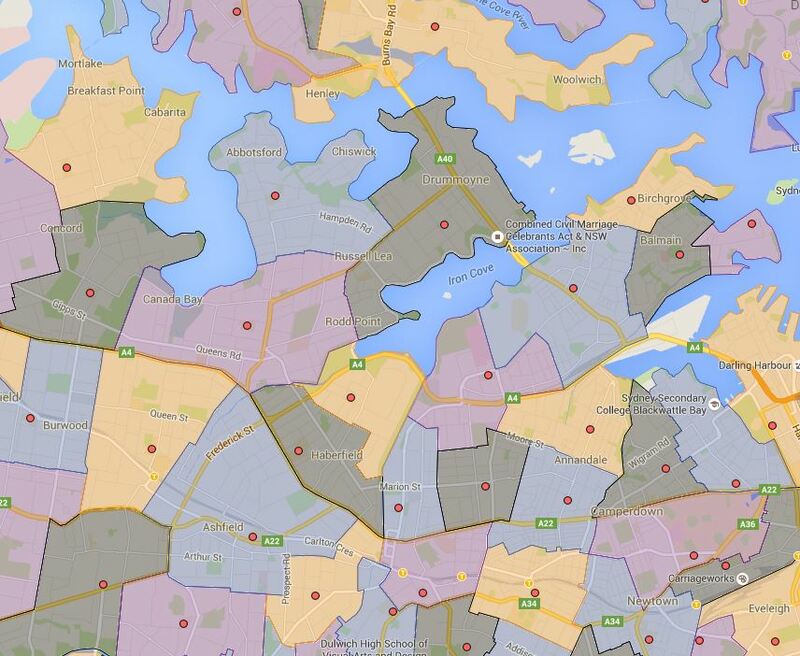 I have been creating Sydney Public School catchment maps and making them public for the last year. In Sydney each public school has their own specific catchment area that are often bounded by major roads, geographic separations such as rivers, creeks, parks etc. The shape of the catchment boundaries are generally irregular and in general there is no overlap from school to school. The catchment is defined by the NSW Department of Education and they may shrink or expand depend on the enrolment number and space available at each public school in question. In Sydney the school question is legally obligated to accept the students if he or she resides within the catchment of the school in question. Following is a sample of Sydney Inner West Public School to illustrate the case. For Melbourne Australia’s second largest city, the system is very different. First of all it is not called the catchment, but “Local Neighbourhood Zone”. However the school in question often refer it also as catchment, school zone etc. In the past the rule for Mebourne is that you are zoned for closest school to your residence from the front door of the school. So it use to be be where you can pull out a ruler and measure it on a map and able to determine fairly reliably which primary school catchment/zone you current address will fall into. 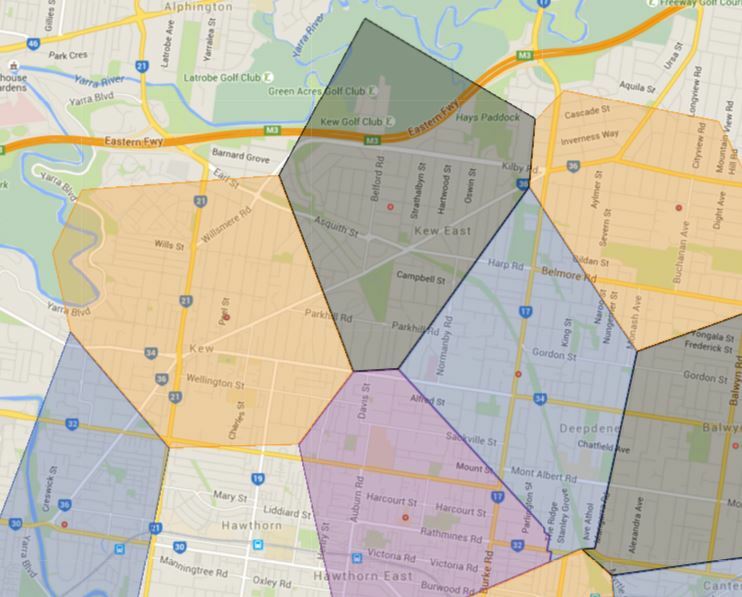 What happen with this rule is that the actual representation of the school catchment/zone will look like a polygon, please refer to the following image as an example. I suspect this model was adopted originally because there is not much enrolment pressure and students likely could have gone to the neighbouring schools should they wish to most of time. However with the recent enrolment pressure, large number of inner Melbourne city primary schools have now got specific school catchment/zone very much like their Sydney counterpart, this number is going up rapidly and in a few year the inner Melbourne school catchment map will likely look very similar to what Sydney look like now. One thing to note is that schools with specific zoning often have overlaps between neighbouring schools. So if student in question reside in that overlapping area, they have the option of choosing which school they wish to attend. Also with the increasing enrolment pressure in inner Melbourne, a lot of schools have also got enrolment ceiling in place which means once that is reached they will not accept further enrolment even if the student in question resides within the official school catchment/zone area. An example of the Sydney style school catchment/zone that are happening in more regularity in inner Melbourne city. As usual contact the school in question or Department of Education for the final confirmation on school catchment/zone matter.